This Integrating Framework (IF) will link basic science research in the GAPs with system-level membrane performance by evaluating macroscopic membrane properties using the Model Fluid Platform (MFP). The goal is to estimate the impact of GAP-based materials breakthroughs on system-level separation performance and energy use and to translate system-level membrane performance needs to materials design targets in each GAP. 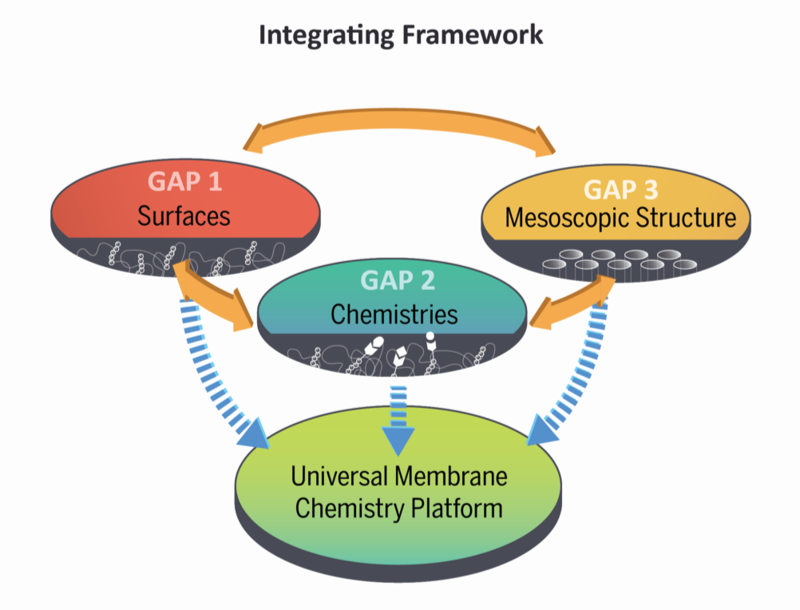 Each GAP will design specific elements of a membrane system (i.e., surfaces/interfaces (GAP 1), separation layers (GAP 2), and mesoscopic porous materials (GAP 3) using the UMCP toolkit. The IF will characterize UMCP-derived membranes with respect to macroscopic properties such as fouling, flux, and rejection from the MFP to evaluate novel membranes developed in the GAPs with respect to system/process design, ensuring that molecular level materials advances translate to improved separation, minimum energy use and system level resilience. Similarly, the IF will communicate the relative benefits of improved materials design back to the molecular and mesoscale research in the GAPs to identify, catalyze and prioritize the highest impact research. The IF will also serve as a center-wide resource to harmonize and match models across scales to ensure that models and theory at one scale (e.g., atomic) are compatible with those at other scales (e.g., molecular, mesoscopic or continuum). From synthesis to application, membranes rely on “time-dependent far-from-equilibrium behavior” at a hierarchy of length scales, ranging from molecular to mesoscale (Navier-Stokes) to macroscale (membrane scale). While equilibrium models typically scale from molecular to macroscale, rate models are rarely consistent across these scales, thereby frustrating efforts to apply consistent, fundamental models across vast ranges of length scales, and hindering predictive design of membranes. Breakthrough progress requires moving beyond fundamental insights at any one scale (as they might appear in an individual project), to transformative design rules and new materials. To this end, an interdisciplinary research team, comprising synthetic chemists, material scientists, and engineers has been assembled, including experts in advanced spectroscopic methods, molecular and constitutive models, theory, membrane science, water, and water/energy nexus considerations at large (i.e., system) scale. A key to this Center’s success will lie in leveraging these tools and fundamental understanding of thermodynamics, transport, and reactivity developed in the GAPs to create the basic science knowledge foundation to drive the creation and design of next generation membrane materials tuned for specific energy-relevant applications. M-WET will pursue three projects within this IF towards fulfilling its bigger vision. Ensure that fluid and platform characteristics are consistent across gaps and meet the needs for each project. Develop tools and models for achieving the above goals. Identify circumstances for which a Fickian approach is valid and the limitations to Fick's law in the UMCP. Verify expected systematic trends identified by models. Identify and develop pre-treatment technologies required for optimizing novel membranes in GAPs. Integrated membrane technologies can achieve higher water quality and reduced energy consumption.